This is a brownie made in a nice round shape so that it can be served for dessert. A brownie is perfect at any time but imagine eating it with ice cream and salted caramel sauce. Sounds good don’t you think? Last week I made a cake and took it to The Gasoline Pony, this is what happened. People seemed to like eating cake with their cocktails so The Gasoline Pony and I have banded together to create a cake of the week for a limited time. Well this is the cake this week, a gluten free Brownie Cake Salted Caramel and Chocolate Bombs. I am told it will be served with a scoop of ice cream. “The Gasoline Pony”, is one of my favourite places in Marrickville. There’s a never ending parade of Australian live music and lots of friendly people. They are doing their best to support Australian music so get on down there . Follow them on Facebook here . This is the recipe I used for my brownie ice cream layer cake so, if you master this then, next stop layer cake. And Chocolate bombs?. Gluten free little round crispy bombs that I use for cakes. Brownie Cake Salted caramel and Chocolate Bombs. The way to go! Line a round 24 cm /10 in tin with a removable bottom. Put the sugar and eggs in to a stand mixer and beat while you prepare the other ingredients. Mix the almond meal and cocoa getting rid of any lumps. When the eggs and sugar look thick and doubled in volume, stop the mixer and add the chocolate butter mixture and almond cocoa mixture and beat together till combined. Bake for approximately 30 minutes depending on your oven. Test with a skewer at 30 minutes. The skewer should come out with a little bit of damp chocolate ( better under done). If it needs a little more time allow 5-10 minutes. Put the sugar in a heavy bottomed sauce pan with 2 Tablespoons of water. Heat on medium to high till all of the sugar is dissolved swirl a little but don't stir. If some of the sugar sticks to the sides add a Tablespoon more water. Once golden it will darken quickly so turn off and add the cream. It will bubble a lot. Stir with a whisk. Put the pot back onto very low and gradually stir in the butter letting it bubble a little. Take off the heat. Add 1/2 the salt stir and taste and then the rest if you want more. Cool the pan down by dipping the base into some cool water. Add the extra water if you want a thinner sauce. 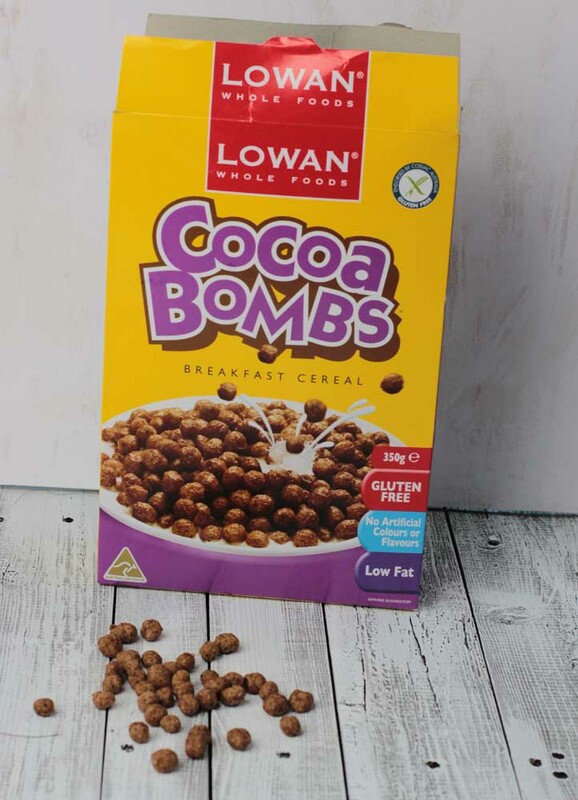 The chocolate bombs are a gluten free cereal. 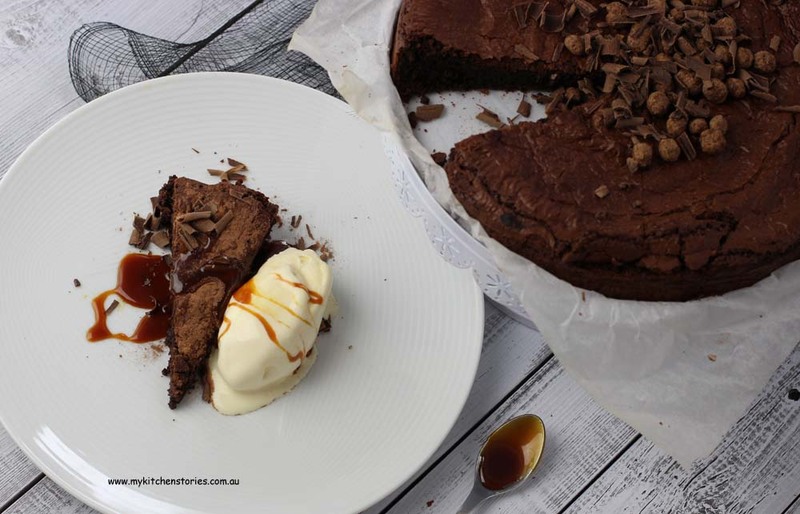 One you pour the caramel over the cake to serve sprinkle with chocolate bombs and grated chocolate. 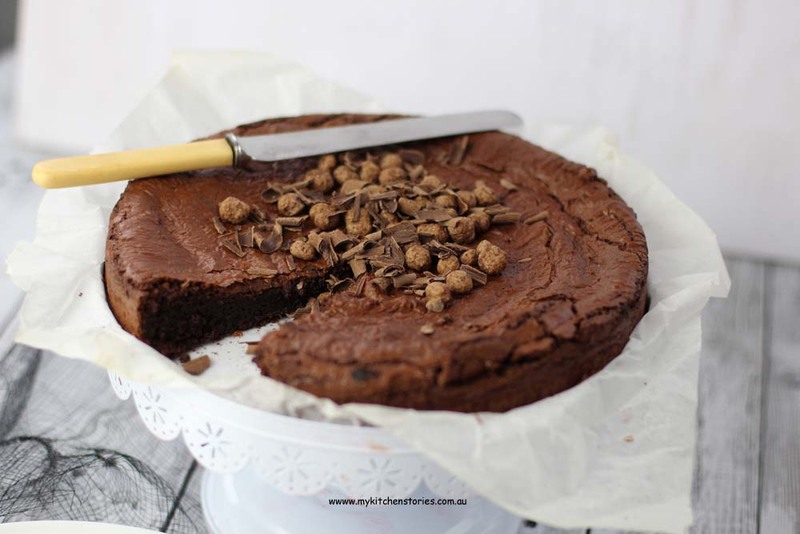 What a divine looking brownie cake! And good on you for getting the gig at Gasoline Pony. 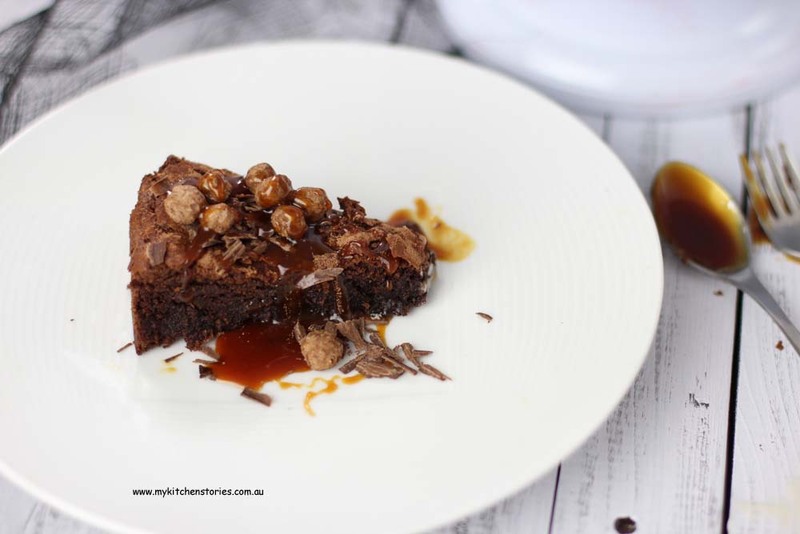 Brownie with salted caramel sauce? Be still my heart. Yum yum yum! How exciting that you got to pair up with one of your favourite restaurants. That’s brilliant you teamed up with your favourite bar/restaurant – what a great gig 🙂 A brownie cake is very clever too. I looked at this and wondered what was on top. I LOVE brownies and I also love live music places. Sadly, we’re sorely limited in that up here. I wish I could join you! I’ve never thought of using cereal as a cake topper! This looks great though – what an amazing dessert. Just wow. 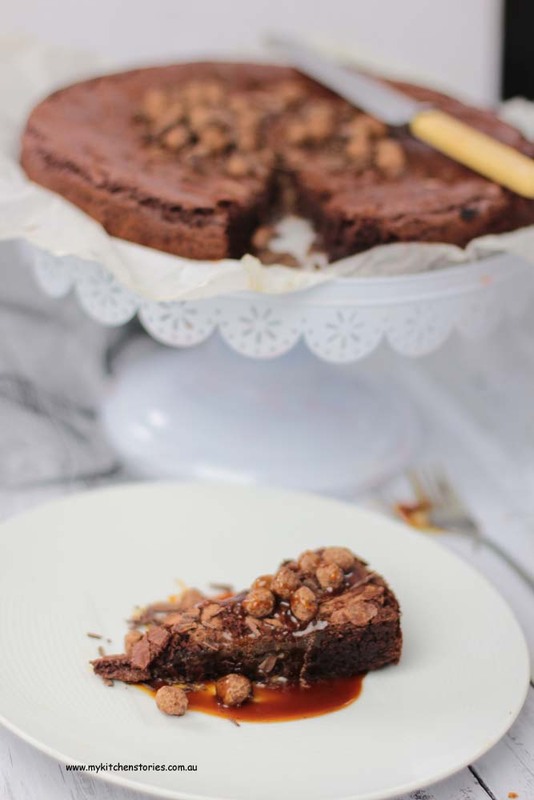 This looks so gooey and decadent – love it! 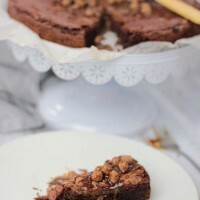 A brownie cake is my kind of dessert! I also love the use of cocoa bombs to decorate the cake/brownie – perfect. Thank you for linking yup with us for Fabulous Foodie Fridays, I hope you have a lovely weekend.